If you’re an iPhone 4 owner and enjoy watching movies, streaming music or or movies a lot over the 3G Network, you might have noticed that 2GB is not enough for that. Unfortunately, there is no Unlimited Data Plan Available anymore, AT&T Dropped that option very close to the release of the iPhone 4. Yup, that’s all right, there’s no unlimited data plan for the iPhone! But there’s way to get around and get the unlimited data plan on your iPhone and you don’t need a new contract or line, all you need is an iPhone 2G( First Gen; Edge only) or a dumb(edge only) phone and a new blank SIM Card. First, go to an AT&T store or call them and tell them you lost your iPhone 4 and want to use the ”Dumb Phone” now. Tell them you want to activate the Dumb phone with a new SIM Card. Then they will ask you for the ”Dumb Phone” IMEI number, this can be found in the battery casing or by dialing *#06 #, and the sim card serial number. AT&T free MSG: Did you know an eligible data plan is required for your iphone? 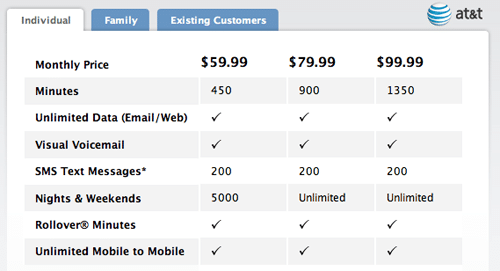 Call 611 or visit att.com/iphoneplans for details. That it! That all you got to do to get unlimited data on your iphone.